Well, what do you know. With the former MG-Rover plant in Longbridge set to start firing on all about a third of its cylinders, new owner Nanjing held a ceremony last week to mark the occasion. And look what they rolled out. 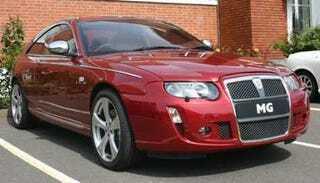 It's a coupe version of the erstwhile Rover 75. It's a swankily appointed show car created in 2004 to show then suitor Shanghai Automotive it could come up with a marketable design in, like, 90 minutes. Will it be built as part of the company's five-year plan? Who knows. Technology from 1998 is so late nineties.